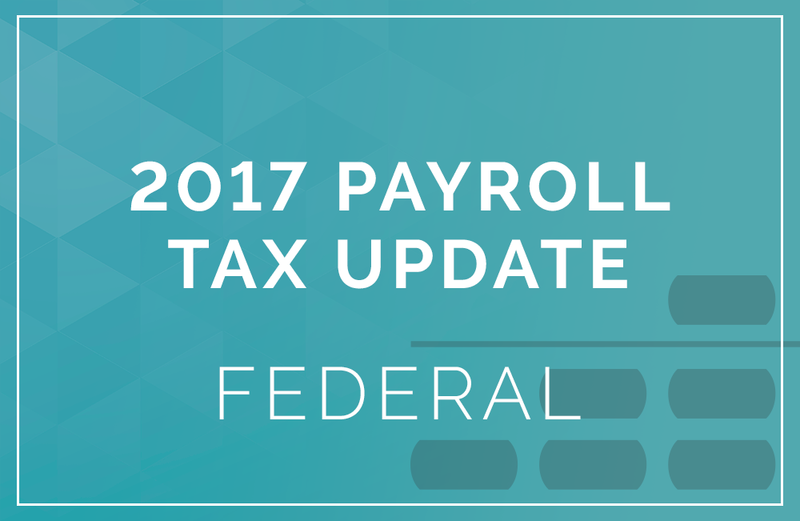 Here is a summary of the federal 2017 payroll tax changes including Social Security, Medicare, Unemployment Tax, Minimum Wage, 401(k) limits and more. The wage base increases to $127,200 for Social Security and remains UNLIMITED for Medicare. For Social Security, the tax rate is 6.20% for both employers and employees. (Maximum Social Security tax withheld from wages is $7,886.40 in 2017). For Medicare, the rate remains unchanged at 1.45% for both employers and employees. A 0.9% additional Medicare tax must be withheld from an individual’s wages paid in excess of $200,000 in a calendar year. There is no employer match for the additional Medicare tax. The wage base remains at $7,000. The effective tax rate for 2017 is 0.6%. A social security beneficiary under full retirement age can earn $16,920 before benefits are reduced. For every $2 a person under full retirement age earns over $16,920, $1 is withheld from benefits. In the year an employee reaches full retirement age, $1 in benefits will be withheld for each $3 they earn above $44,880 until the month the employee reaches full retirement age. Once an employee reaches full retirement age or older, their benefits are not reduced regardless of how much they earn. The federal minimum wage rate per hour for 2016 is $7.25, effective 7/24/09. The maximum employee pretax contribution remains unchanged at $18,000 in 2017. The “catch-up” contribution limit remains at $6,000 in 2017 for individuals who are age 50 or older. The maximum salary deferral contribution remains unchanged at $12,500 in 2017. The “catch-up” contribution remains at $3,000 in 2017 for individuals who are age 50 or older. Employers must pay their Federal Tax Liabilities through the Electronic Federal Tax Payment System unless they pay less than $2,500 in quarterly payroll tax liabilities and pay their liability when filing their employment tax returns (Forms 941 and 944). All new employees are required to file Forms W-4 and I-9 which are to be kept on file by the employer. A new Form W-4 should be obtained when an employee’s filing status or exemption changes. Be sure to request and keep on file a completed Form W-9 from all non-corporate taxpayers to whom your company pays commissions, interest, rents, etc., totaling $600 or more, and also payments made to certain incorporated entities such as attorneys for legal services and providers of medical and health care services. Social Security has eliminated the use of magnetic tapes, cartridges and diskettes as a means of filing W-2 reports to SSA. Reports containing 250 or more W-2’s must be filed electronically via the Social Security Business Services Online (BSO). Employers filing 250 or more Form 1099s with the IRS also must file electronically. Form 1099 must provide payer telephone number or will be subject to penalties. The due date for filing 2016 Form W-2 with the Social Security Administration is now January 31st. This also applies to certain Form 1099-MISC reporting for non-employee compensation such as payments to independent contractors. Prior deadlines were end of February for paper filing and end of March for electronic. Which still applies to Form 1099-MISC other than payments reported in box 7. Click here for our recent article update on the new filing deadline. Employers are required to include the aggregate cost of employer sponsored health benefits on the 2016 W-2’s in Box 12 with code DD. It is for informational purposes only and will not be included in taxable income. Please contact us regarding the specific types of health benefits to be recorded. Small employers who file fewer than 250 Forms W-2 are exempt. Household employers are required to withhold and pay FICA for domestic workers (age 18 and older) if paid cash wages of $2,000 or more in 2017. The $1,000 per calendar quarter threshold continues to apply for FUTA. These taxes are reported on Schedule H of the employer’s personal tax return (Form 1040), but must be remitted through withholding or estimated payments during the year. For Pennsylvania and New Jersey, unemployment coverage applies for domestic service in an employer’s private home for cash wages of $1,000 or more in a calendar quarter in the current or preceding calendar year. For further information contact us or call the State of New Jersey at 1-877-654-4737 (NJ-HIRES) or Pennsylvania at 1-888-724-4737 (PA-HIRES).